2007 – Apple has finally announced the system requirements for Mac OS X 10.5 Leopard: a drive that can read the DVD install disc, at least 512 MB of memory, and an 867 MHz G4 or better. That said, we’ve heard from the field that if you install Leopard on a supported G4 Mac and move the drive to another G4 Mac, it works, so it is possible to run Leopard on titanium PowerBooks below 867 MHz. It’s also possible to connect an unsupported PowerBook to a supported Mac in Target Disk Mode and install Leopard to the PowerBooks drive from the supported Mac. Another option is to use Carbon Copy Cloner to clone a PowerPC Leopard installation onto the internal hard drive. There are also online instructions for hacking the Leopard installer, but you’ll need a Mac with a SuperDrive to burn a copy. For more info on getting Mac OS X 10.5 on unsupported Macs, see our article on Unsupported Leopard Installation. 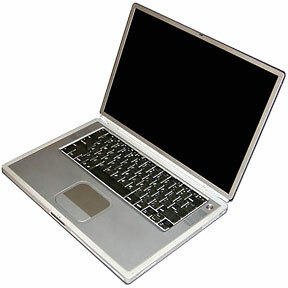 The first G4 PowerBook was announced at Macworld Expo in January 2001, and the first units reached dealers at the end of the month. I picked mine up that day. I was using a 400 MHz Power Mac G4 at work, and it was plenty of power for me, so I opted for the 400 MHz PowerBook with 128 MB of memory, a 10 GB hard drive, and DVD-ROM. (The 500 MHz model had 256 MB of RAM and a 20 GB hard drive – and it cost $900 more.) Both models shared the 1″ thin titanium design and a 15.2″ 1152 x 768 “megawide” display supported by ATI AGP 2x Rage Mobility 128 and 8 MB of video RAM. It was a wonder. This was the machine I used when I first flirted with Mac OS X 10.1, my production machine as I embraced OS X 10.2 and moved to 10.3, and still fast enough to handle Mac OS X 10.4 decently when Tiger shipped. It’s a shame it died before having an opportunity to try 10.5. I don’t expect great things from 400 MHz and 500 MHz G4 PowerBooks, but if you max out RAM and have a fast hard drive, it will probably run Leopard decently. However, Tiger may be better suited to this generation. The next generation of G4 PowerBooks was a speed bump. The entry-level 550 MHz model was just a bit faster than the first generation 500 MHz PowerBook G4, while the 667 MHz model provided a significant speed boost. Other than speed, the biggest difference was incorporating ATI AGP 4x Mobility Radeon graphics with 16 MB of dedicated video memory, making these much better suited to the Aqua interface of OS X. These models initially shipped with DVD-ROM drives, and Apple switched to Combo drives (CD-RW/DVD-ROM) in mid-December. These should handle Leopard reasonably – and a fair bit better than the earlier generation models, especially the 667 MHz model. Again, 1 GB of RAM (starting at about $120 these days) and a fast hard drive will make a big difference. At 667 MHz and 800 MHz, these are a bit shy of Apple’s official requirements for Leopard, so you’ll need to work around the limitations of the installer to get OS X 10.5 up and running, but they should handle it comfortably. Again, 1 GB of RAM and a 5400 rpm or 7200 rpm hard drive with an 8-16 MB cache will unleash this model’s full potential. The oldest PowerBooks that meet Apple’s official system requirements are the 867 MHz and 1 GHz PowerBook G4, which were introduced five years ago. They include ATI Mobility Radeon 9000 AGP 4x graphics with 32 MB (867 MHz) or 64 MB (1 GHz) of dedicated video RAM. The top-end 1 GHz model even came with a SuperDrive, the first time Apple put one in a notebook computer. Installing Leopard shouldn’t pose any problem at all, and it should be comfortably fast, especially on the 1 GHz model with 64 MB of VRAM. The entire range of titanium PowerBooks boots into the classic Mac OS as well as OS X. They are a bit fragile, known to suffer from broken hinges if not treated carefully, and prone to scratching. The titanium significantly impairs AirPort range, so we recommend a third-party WiFi PC Card with its own antenna if you want to go wireless. This was before Apple embraced USB 2.0, so the USB ports are the older, slower USB 1.1 variety. Low End Mac’s Best Titanium PowerBook G4 Deals, updated biweekly.